It’s no secret that I adore my LAMOSE water bottles. Ever since I discovered these plastic-free, all stainless steel water bottles that keep drinks cold for 24 hours, or hot for 12 hours, I have not used any other bottles! They are so easy to keep clean, AND you can get them custom engraved. I was really excited when I found out they were making smaller versions of the Robson bottle – the perfect size for my daughter! The Robson bottles I have are 21 oz, and the smaller version is 14 oz. My daughter loves the sky blue colour of her bottle, and also loves that she has a daughter sized version of her mom’s and dad’s bottles. I have to admit I have also taken her bottle with me on shorter trips out when I don’t need my full-size bottle. I’m also thrilled that I can send her a water bottle to school that doesn’t contain any plastic! Goodbye old school plastic straw bottles! The Hudson Mug I got is perfect for my husband. At 18 oz, it holds lots of coffee or tea so he can keep it next to him while he works. His workstation is in the basement of our house which gets rather cold in our chilly weather. He has been very happy with how long this mug keeps his drink hot while he’s working away in the cold! People indicated that they wanted to be able to see their beverage in their cup. A steel lid would transfer heat and potentially burn people’s lips. The only non-plastic lids I’ve seen for a mug like this are made of glass, which offers the additional potential of breakage. So I do understand why the plastic lid. 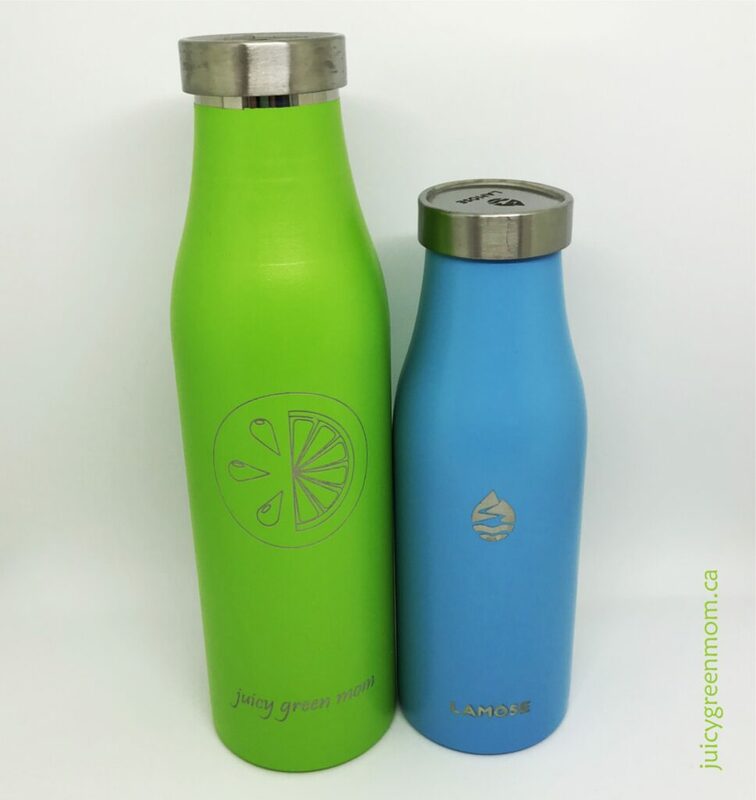 The Peyto Tumbler is perfect for taking on the go, as its narrow body means it fits easily into the side pockets of a bag where a water bottle would go, and in my car. Even though it doesn’t have the same airtight lid as the Robson bottles, it keeps my tea warm for several hours, even if I leave it in my cold car to do an offsite visit for work. (Which is saying a lot, considering the -25C temps we’ve had in Edmonton lately!) I love the sleek design and have gotten lots of compliments on it. Again, the lid on this tumbler is made from the same high quality plastic that is used for the Hudson mug. I asked Chen about reducing waste in the way LAMOSE packages their products as well. Each product comes in a cardboard tube/box, and the plastic they do use in their packaging is compostable. Overall, I’m really happy with every product we’ve tried out from LAMOSE, and I love that we can customize them with our own engraving designs. 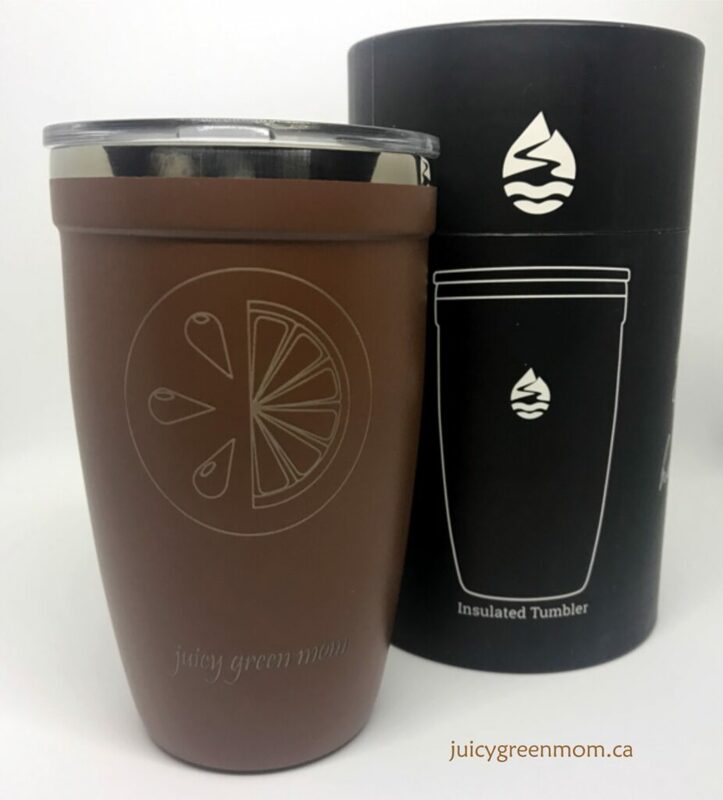 And, it’s really exciting to support a great Canadian company trying to lessen the environmental impact of single-use cups and bottles. 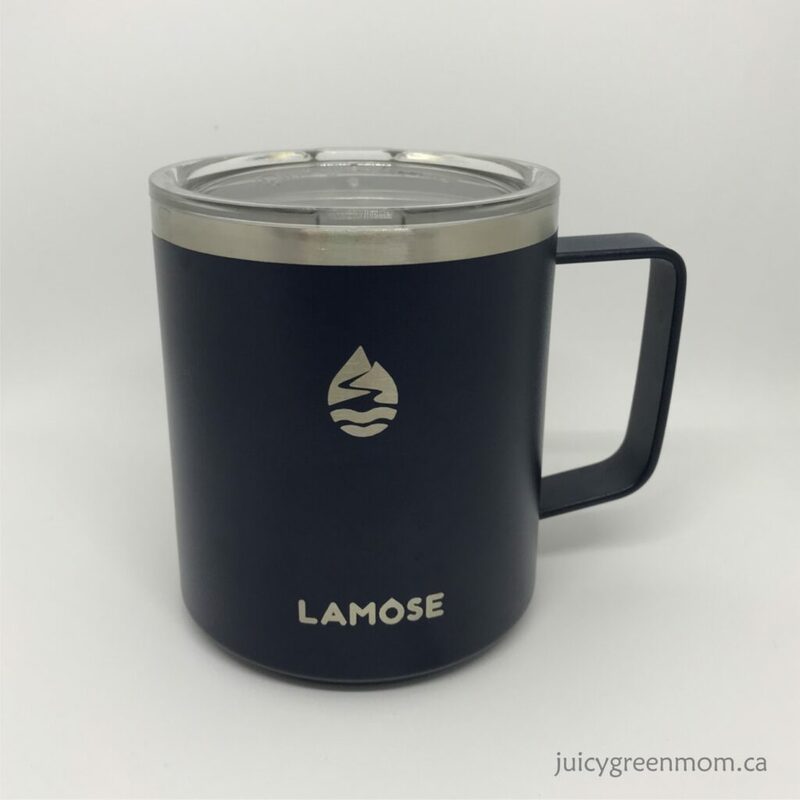 You can get your LAMOSE bottle, mug, or tumbler engraved on site in Edmonton at Southgate Centre, or in Calgary at Chinook Centre. 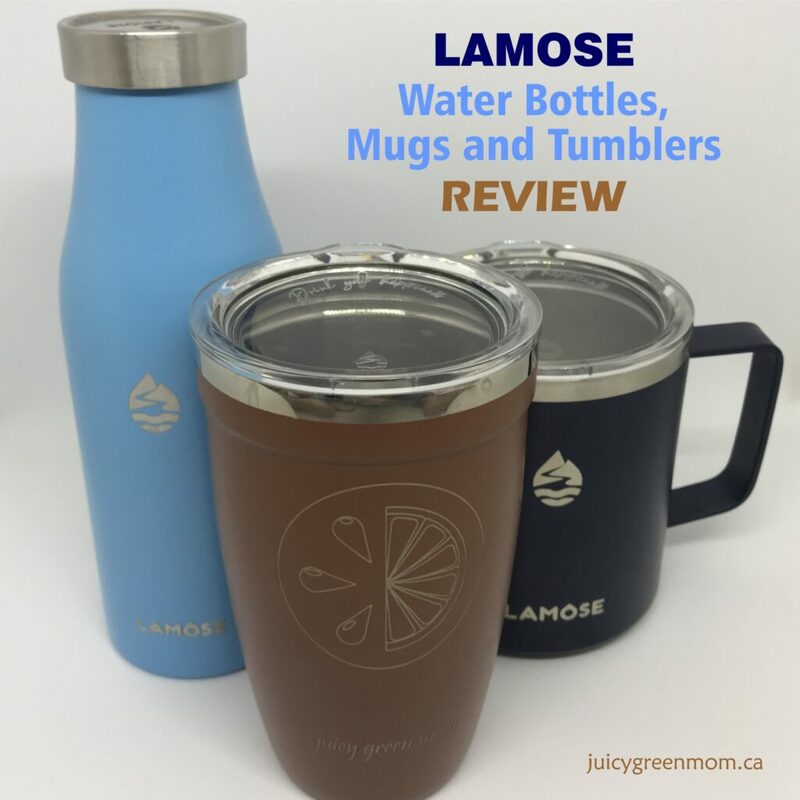 Will you reduce your use of single-use cups and bottles by using LAMOSE reusable products?